Our #4 goal is for clients to have fun, educational, exciting and memorable experience that reflects visitors interests and needs. There are many interesting and exciting things to experience in Kachemak Bay, from wildlife to scenery and beyond. We will customize a trip around your interests. Our trips are family-friendly, and we strive to give children a trip of a lifetime. We specialize in half-day (up to 4 hours) and full-day (up to 7 hour) trips. 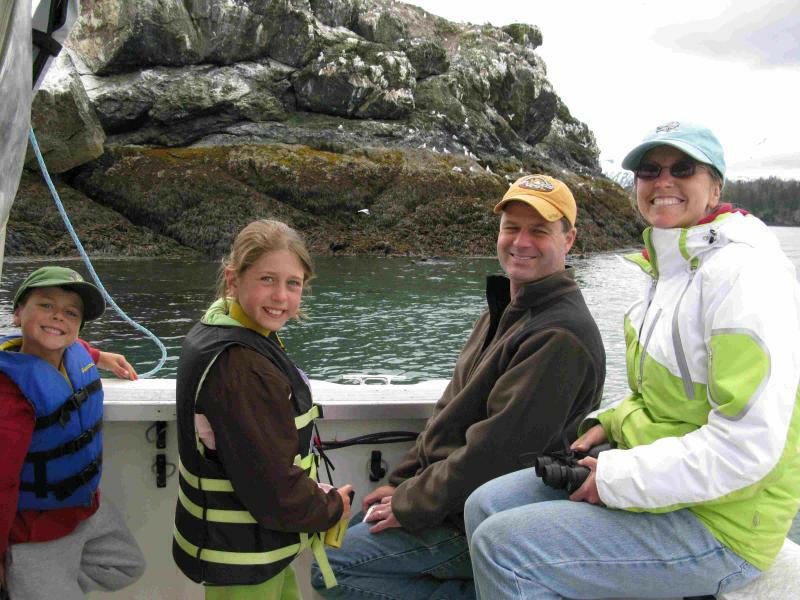 Private charters are available for guests wanting a intimate family or small group experience. Full-day trips are one of our most popular trips. Guests see more wildlife and experience more of Kachemak Bay and State Park and at a more relaxed pace. A full-day public trip* starts at $600 (up to 3 people). Each additional adult is $200 (children $150). Alternatively, a group can book a private trip (the whole boat, up to 6 people) at $850. Bring your own lunch or we will arrange to bring your lunch. 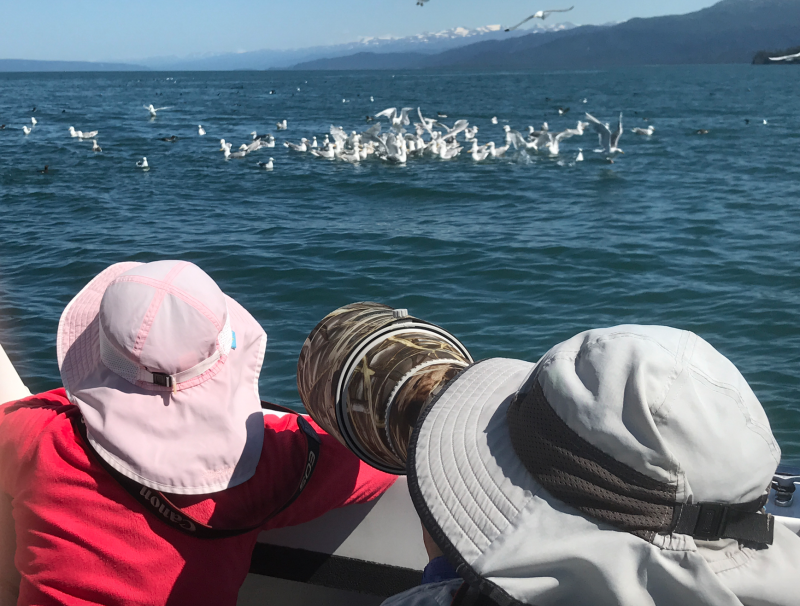 Half-day trips are common among guests that have more limited time or a shorter stay in Homer and want see to more wildlife and the Bay than is possible through a quick, 2 hour tour. Others are interested in a short family-friendly alternative for adults or children left behind on fishing trips. Half-day public trip* starts at $450 (up to 3 people). Each additional adult is $150 (children for $100), or a group can book the whole boat at $650 for a private tour (up to 6 people). * Note: Through a "public trip," we can combine groups on one tour up to total of 6 people. If we able to combine groups, parties of 1 or 2 people will be refunded for "empty" seats so all passengers pay the same amount. Winter Specials (October 15 to April 30): Need a winter break? This is great time for wildlife trips, including bird watching, eagle photography, and viewing marine mammals. Plan a full-day to 2 hour tour or photo safari on the Pinbone with a fully-enclosed, heated pilot house, large deck, and comfort facilities. We offer full-day trips at 5% discount off the summer rates (up to 6 people). Two-hour wildlife tours at $75/person (4 person minimum). Kachemak Bay is rich in species diversity. 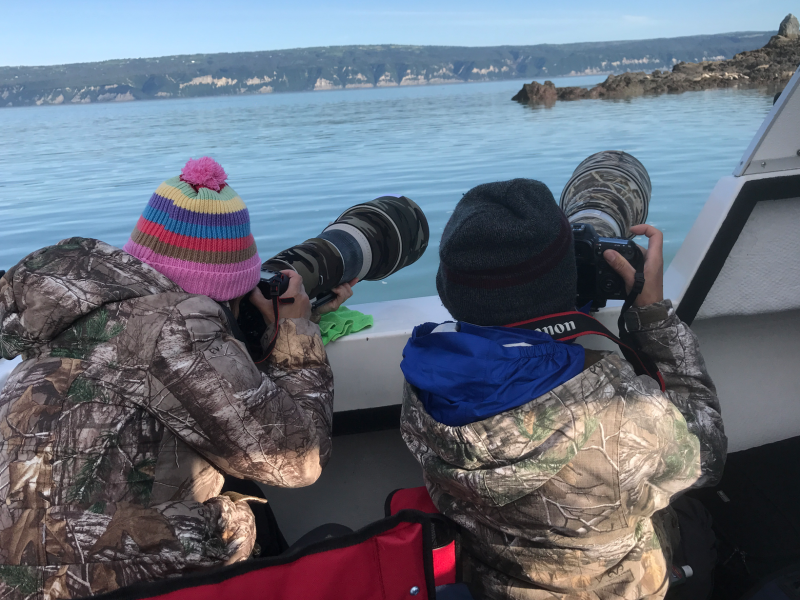 Visitors will likely see marine mammals sightings that include 100s of sea otters, harbor seals, and an occassional sea lion, Orca or Humpback whale. The Bay and adjacent lands are also very rich in bird life. A wide variety of seabirds, waterfowl, shorebirds, shorebirds, and other coastal birds will be seen. Kachemak Bay has some of the most diverse and productive tideflat and rocky intertidal beaches in Alaska. Tidepool exploration and discovery tours (i.e., tidepooling) are designed to peak the interest and excitement of young children to adults of all ages. Guests will learn the basics of shoreline zoneation; what lives where, and why; how tides, waves, and substrate affects distributions of animals; and some of the ecological interactions of the animals and their environment. Tidepooling is offered as part of a full-day trip. Tidepooling is limited to four to six days a month -- from May to August -- when low tides are -3 feet or lower. In 2019, the best tidepooling days are: May 18-20; June 3-6; July 2-6; and July 31-August 4. Learn about Kachemak Bay's rich history, from early occupation of the area by Alutiiq Eskimos and the Dena'ina Athabaskan Indians to the arrival of western civilization in early 1800's. Kachemak Bay was known by the Dena'ina Indians as the "place to be" during the winter months due to the abundance and diversity of marine food sources. 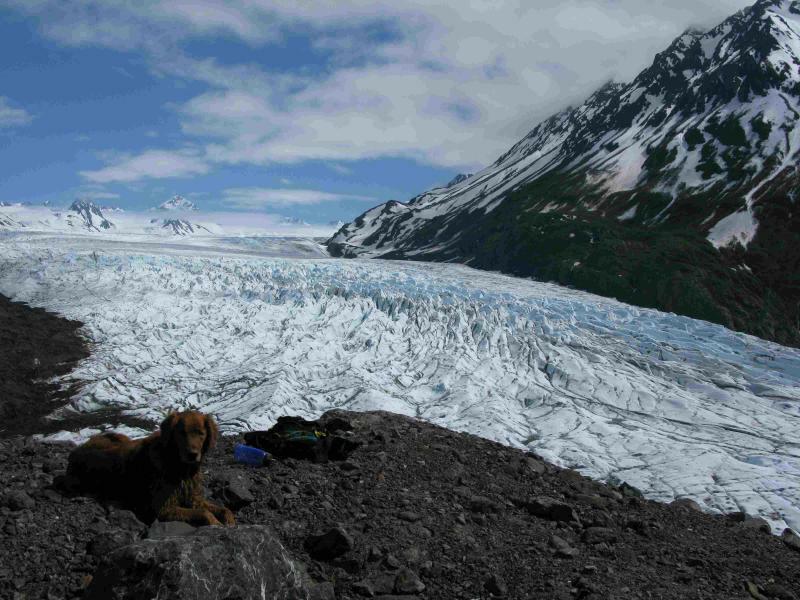 Kachemak State Park and Wilderness area offers a diversity of hiking and trekking opportunities on maintained trails. Guided hikes are offered on full-day trips in combination with on-water tours. For those want a relatively easy and short trip (less than 3 miles round trip), we recommend a hike to Grewingk Lake and Glacier overlook. Glacier views are amazing. For guests that seek a longer hike or want to hike to alpine or sub-alpine, we recommend the Grace Ridge trail. 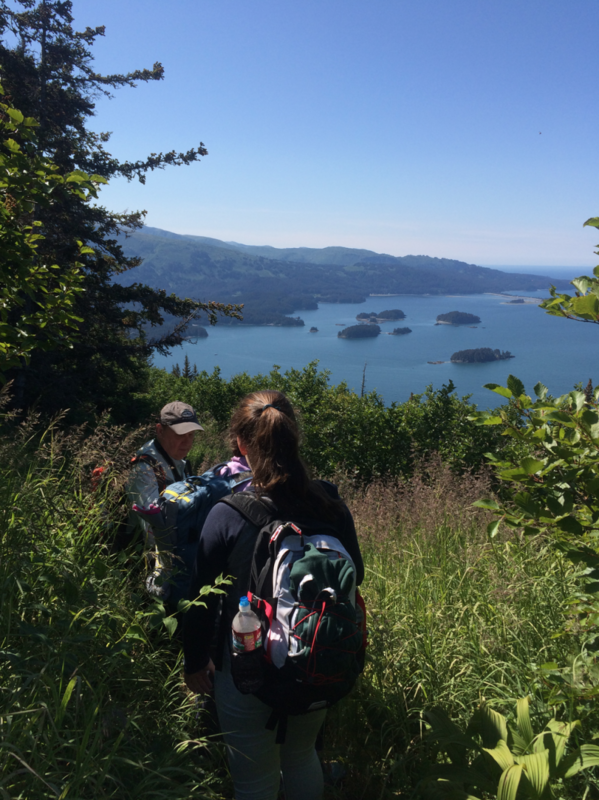 Hikes from either north or south trailheads are considerable moderate hikes and offer incredible views of Sadie Cove and Tutka Bay, and Kachemak Bay and Lower Cook Inlet. Contact us for more details. Discover the best of Kachemak Bay's history, wildlife, and stunning scenery with photographs of your adventure. Captain Glenn will position photographers for the best angles, light, and location so guests can return home with amazing footage from their trip. Looking for something specific? Seaman's Ecotour Adventures can be customized to fit guest desires. Are you, your children, or friends left behind in Homer as others in your group go on half or full-day fishing trip? You deserve a special break too! 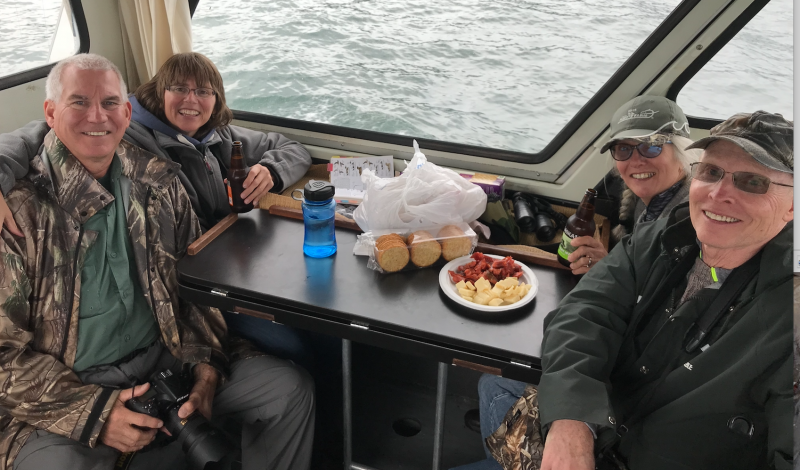 For less than full-day charter, your group can enjoy a half-day tour to experience the wildlife and grandeur of south side of Kachemak Bay. You'll be back in time for lunch and to greet the fishermen. You will see 100s of sea otter and seals and many species of marine birds. Per the wishes of the group. the trip might include a short stop at Halibut Cove Coffee Shop for coffee, ice cream, milk shakes, and other snacks. 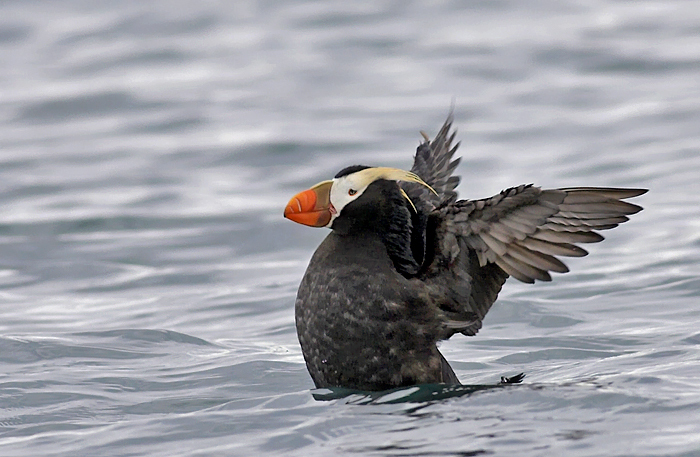 We'll close the trip with a stop at Gull Island to see 1000s of sea birds, including puffins, murres, cormorants, pigeon guillemonts, surf birds, eagles, and variety of gulls. 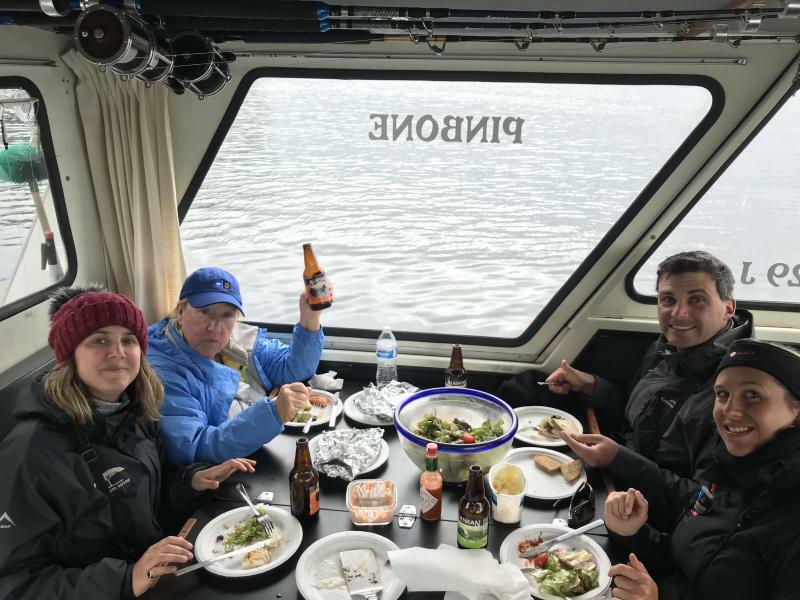 While our trips have an ecotour focus (e.g., the activities listed above), we occassionally get requests from clients who love to fish, to giving take a shot at catching a salmon or rockfish. An hour or two of fishing may be added to full-day tours with previous arrangements. Also note that persons fishing over the age of 16 require a valid Alaska fishing license (children under 16 are free). Additional costs may apply where sportfishing is a more substantive part of your trip. Contact us for options and details. Too busy during the day or just want to have relaxing evening cruise on bay? Evenings are often one of the quietest and most peaceful times of the day, and a great time to view wildlife or enjoy the Bay's incredible scenery or quite coves during the summer. We offer half-day trips, typically starting between 3 and 6 pm, and return to the harbor within 3-4 hours later. 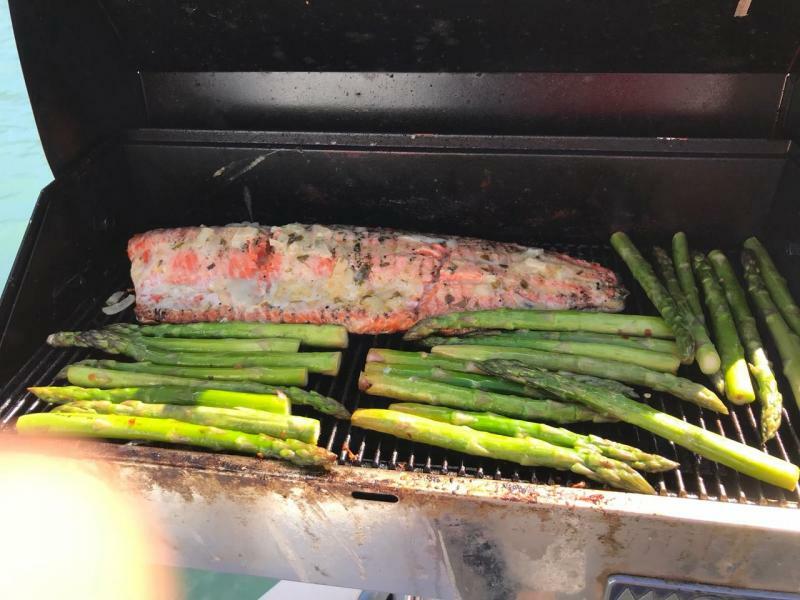 The trip could be simple tour or we can arrange to bring food from one of Homer's fine Homer Spit restaurants to enjoy during your cruise (an additional cost).﻿ We recommend pizza or other specialty items from Finn's Pizza to enjoy during your trip. With advance reservations, we can make arrangements to pick up the food. Contact us for start times and other details. Photographers capturing harbor seals at local rookery. 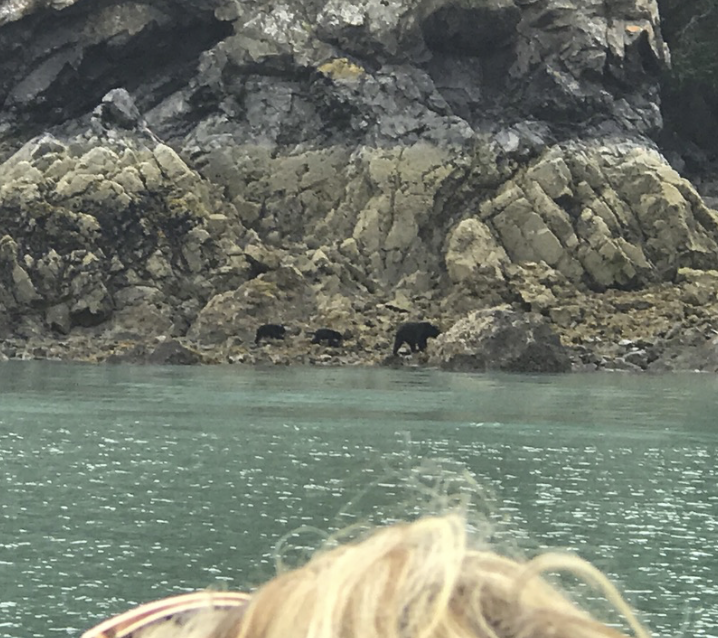 Visitors looking at sea otters with pups in Kachemak Bay (above), and the a view or ottters up close (below). Our tours include complementary snacks and drinks. 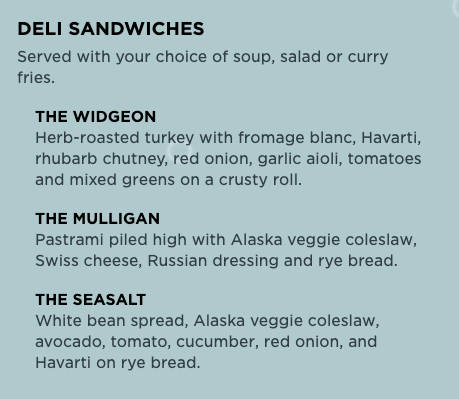 At your request, we will also arrange for lunch, either Deli Sandwich from La Baleine Cafe or,based on availability, a fish BBQ in a quite cove. 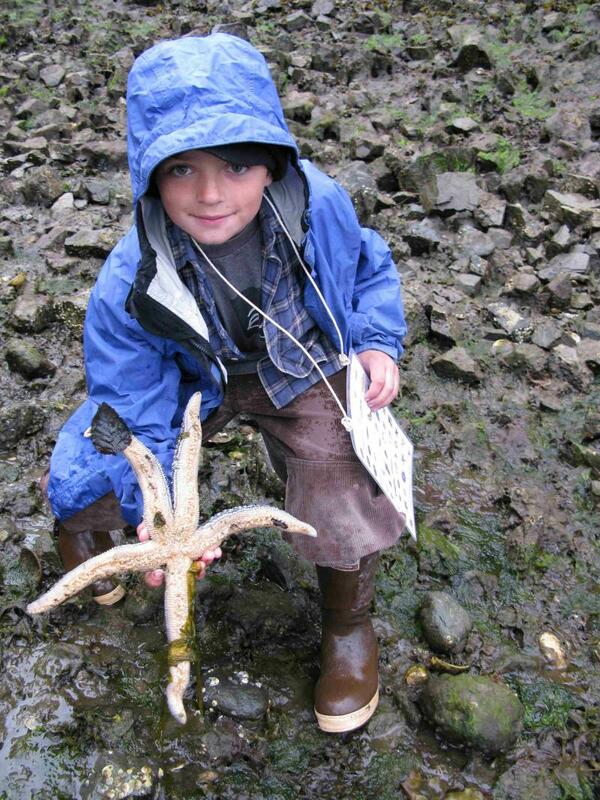 Checking out sea stars on Kachemak Bay beach. 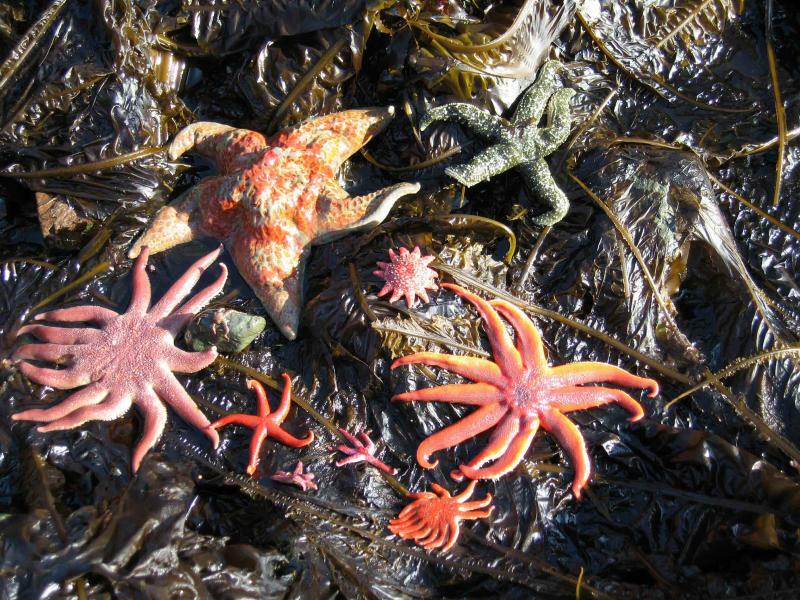 Variety of sea stars found on one tide. 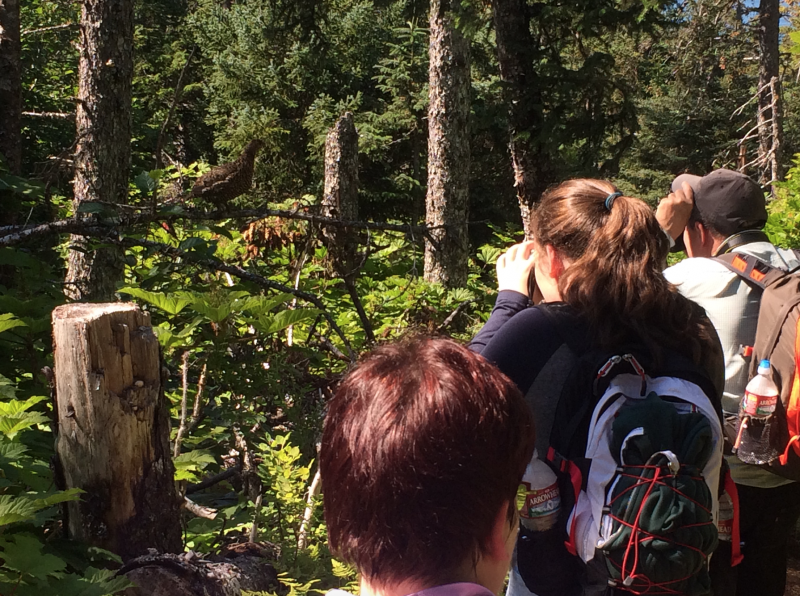 Hikers on lower Grace Ridge Trail enjoy a local spruce grouse (upper left). 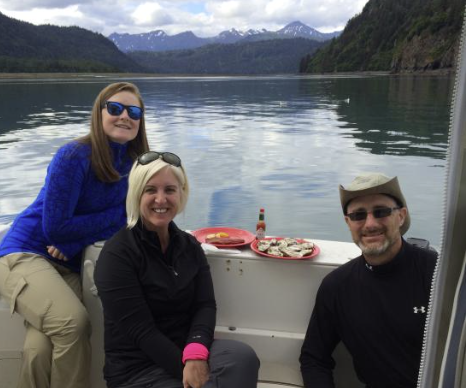 Clients enjoy some "fresh out of bay" oysters purchased from an oyster farm in Kachemak Bay. Let us know if love oysters, and we can make arrangements to visit an oyster farm. Hikers enjoy a subalpine view of Eldrige passage from the Grace Ridge trail. 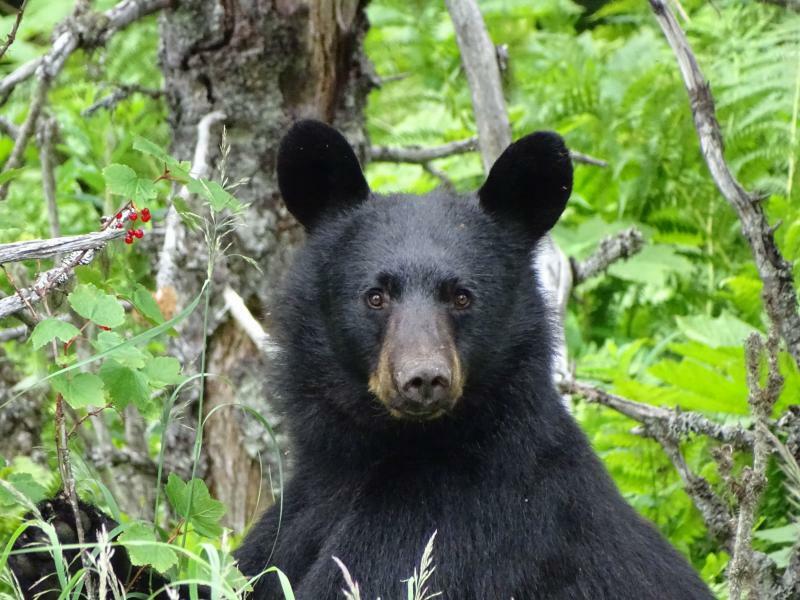 A young, curious black bear seen off the trail on a morning hike. Close up of view of the Grewingk Glacier. Copyright by Seaman's Ecotour Adventures. All rights reserved.